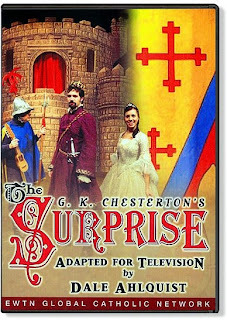 We received our copy of the play "The Surprise" by G.K.Chesterton. This is a very funny play. I am not going to tell you much of the plot as I think that may give away some of the plot twists, but we found it very enjoyable. As always, G.K.Chesterton has some very clever lines including [from memory] "It is not the best to marry the one you love, but to love the one you marry". I would greatly recommend watching this one as a family. Younger children (under 10) may find this a little slow, but older ones will be able to understand what is going on and quickly understand the contrasts between the two parts of the play and the surprise ending. We will be watching this many times. 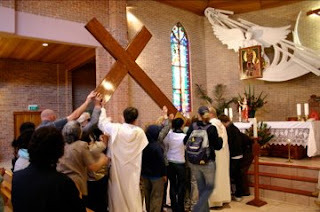 Yesterday the World Youth Day (WYD2008) Cross came through the local area. We joined in with locals to carry the Cross and Icon to the Pauline Fathers Monastery. In July this year Pope Benedict XVI will be visiting Sydney, Australia to be with hundreds of thousands of Catholics. Perhaps we should attend seeing we are this close? This being the closest weekend to the actual date we celebrated Clare's birthday today. 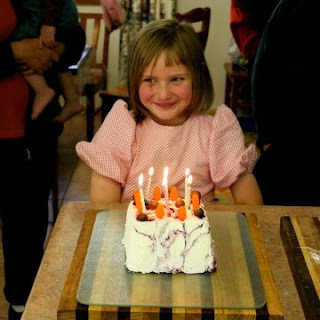 She is very excited to be such a big girl now she is 7 years old. One of our friends asked her what it was like to be seven. "Wonderful! I was six for just so long!" Clare replied excitedly. "What else is good about being seven?" I asked. "You're older. You get to get more things. Like Ariel. She has more things because she's older." "So you want to work, too, like Ariel?" "No!" she answered quickly, "When I'm older like Ariel's age. A long time from now." Once more, time is a relative thing. I looked over at Martin during dinner and saw his hair in a mohawk style. Eric looked sheepish with a grin - would that be elfish? He has lots of fun playing with Martin. 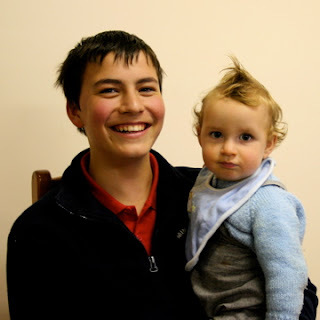 I figured this would make a good photo to include in Martin's 21st birthday collection. You have to plan ahead for these type of things. Earlier efforts of his with Rose are here and here and here. Does anyone have an idea as to the type of spider this is? Update: The Australian Museum thinks the spider may be this one. I suspect your spider might be either Eriophora (formerly Araneus) praesignis or a close relative. It is harmless and builds a small orb web amongst lush foliage. It is not thought to be particularly common. We could be more positive of the identification however if you can supply a specimen.Here is a link. You will note that the colour is different but the species seem to be quite variable. The Search and Discover facility of the Australian Museum is a very useful service provided by the Australian Museum. Thanks for the help! Yesterday we had a boys day out. Eric, James and I visited Sydney for some wargaming, but also to visit one of the large bookstores and just have a day out. I realised we hadn't been to the city for a while when James and Peter were impressed we travelled in a tunnel which went under lots of houses and roads and we travelled under the runways of the airport while planes were landing and taking off. As we were approaching the city outskirts, Peter was amazed at how tall some buildings were. I suggested he wait until we get to the city center as 10 stories isn't really that big. When we saw a really tall building in the city center, Peter said, "It's so tall they called it Ernst Young. Why did they name the building?". Their experience of large cities is limited as there is little parking for large vans like ours. Maybe that's why you rarely see families in the city center? 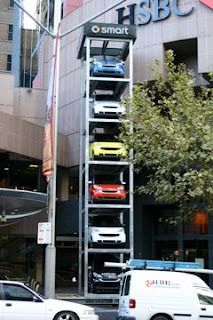 Our first photo here is of a stack of "Smart" cars. These are itsy bitsy cars which would be great for singles and couples and for driving around the city, but would fit in the storage space of our van. The boys thought they were cute. Whereas other boys might say "ooh" and "aah" over sports cars, our boys first comments are normally, "Where do you fit the children?" Another thing they saw was some statues outside a pub of the three wise monkeys - See no evil, speak no evil and hear no evil. This led to good discussions too. As there are so many people, there are more advertisements, which means there is a chance some of the advertisements are actually interesting. Our second photo is for a series of advertisements promoting Wonderbread, a brand of white sliced bread with lots more additives to make up for the additional processing which took everything out. I was ambushed by the children on my return home last night. I had been away or a few nights for work and they had most important news to tell me. "You need to find the chickens, Dad!" "There are 12 of them throughout the house." "Chickens?" 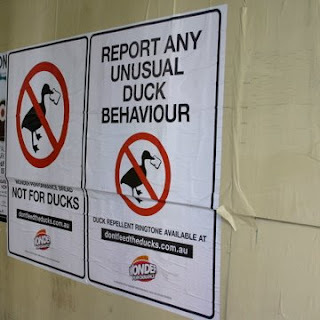 I enquired, "We don't have chickens." "Those ones!" 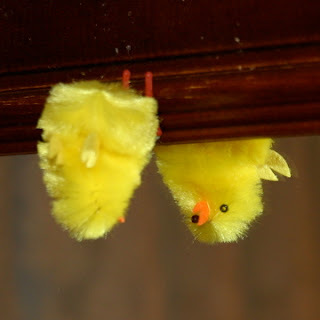 they pointed, revealing a yellow easter promoting chicken stuck to a door post, "We have hidden them everywhere." So I keep finding these chickens everywhere - as promised. This chicken is stuck above the mirror in the bathroom, inspecting me as I get out of the shower. So this must mean Easter is getting closer. The Triduum is next week and chocolate Easter eggs aren't far away. Rose was sitting on Eric trying to get him to play with her. He wasn't co-operating so Rose tried using "little girl logic". "Boys have to play with girls or they won't get married." Rose said. Eric replied, "Well I can't marry you anyway as I'm your brother." Rose put her hands on her hip and said, "James, then." "No. He's your brother too." "No. He is your brother too." Rose let out a deep sigh and said, "Well who am I going to marry then?" Lana has an early start on Saturday Mornings when she makes fresh Strawberry Cheesecake muffins for the local shop. These are the ones she and Ariel won First prizes at the Robertson Show. Rose gets up about this time too and wants to help. "How do you want to help?" asks Lana. Rose thinks carefully and answers, "Licking." Earlier in the week Lana asked all the children to be quiet while Dad was on the phone. Afterwards Clare said to Lana, "I was very quiet. As quiet as a whistle ..." Then she paused for a moment and added "not being blowed." Suppressing a laugh, Lana replied, "Good girl. That was very quiet." Martin has just made it into Defcon 4. He has begun climbing chairs (but hasn't yet worked out he can move them), opens cupboards and runs with items that NEED relocating. Here he is pointing out a tasty target of interest - a huge trifle. A trifle is the best way to use stale cake. Place them decoratively around the inside of a bowl - glass is better because all the children can look in awe at the yummy contents. Pour fruit juice over the cake so it soaks in nicely. Place this in the fridge while you make some jelly (Jello) in a slightly stronger mix than usual. Let it set, then chop it up and throw into the middle of the bowl amongst the soaked cake, or pour it in partly set so it mixes up. Then throw in some tinned fruit too. 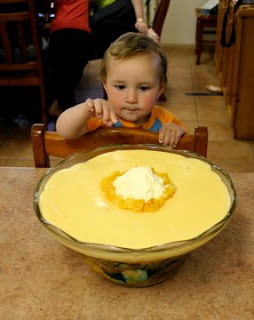 Make up some custard (or pudding) and pour over the top so that it fills all the gaps. Then you can make it pretty with a bit of cream and fruit on the top. Oh yes - an important safety tip: Keep chairs away from the bench so that little children don't stick their fingers in. 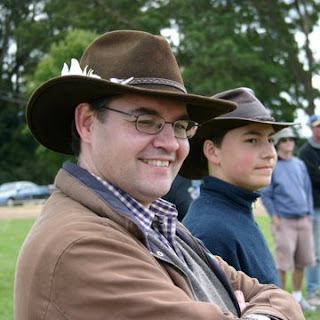 Yesterday we attended the 2008 Robertson Show. This is a truly Australian Country show and it is great fun. If a rule interferes with a family enjoying itself in a wholesome manner it is ignored, over-ruled or changed. The main four commentators - Bruce, Bruce, Bruce and Paddy - keep up a constant banter and ensure no-one is immune from their friendly jibes. They always ask where a competitor comes from and then use that in their banter. "Oh from the US? You certainly swam a long way!" and so on. 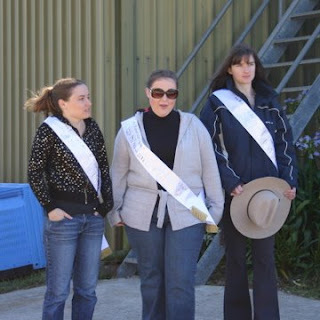 Our first photo is of the Robertson Show Girls. As you can see they are sensibly dressed in the classic Robertson weather - unpredictable. The day was very sunny, but with a mean chill in the air. We all ended the day with sun or wind burnt faces - everything else was covered. We entered 48 entries into the Pavilion in the categories for cooking, tapestry, knitting, vegetables, photographs and any other crafts the children wanted to enter. We ended up with 19 first prizes, 7 second places and 3 highly commended awards as well as Ariel being awarded Junior Champion Needlework and Eric received Champion Exhibit Junior Vegetables. 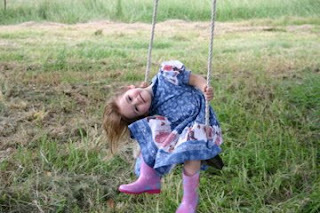 Clare's photo we showed earlier won First prize. Peter and Clare won prizes for their other photos too. 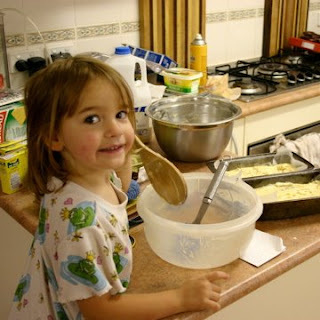 Lana's cooking deservedly won first prizes all over the place, which is just as well as she is making Anzac biscuits and muffins regularly for the local shop. There were also many events held on the day everyone could join in. James thought up a good pet to enter in the Pet show under the "Most Unusual Pet" category. Our skinned Raccoon. Somehow, in a judging controversy, we didn't win, so we re-entered again under the "Ugliest Pet" category and were awarded second prize. All the boys and I went to go into the Pie eating competition. Unfortunately the meat pies, which are apparently world famous, were full of meat and COLD. Have you ever tried eating a cold meat pie. 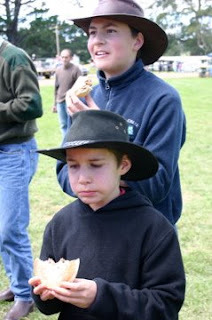 We all could have eaten lots of hot meat pies, but as you can see by the photo, Peter wasn't too impressed. Eric and I entered the Pumpkin Lawn Bowls competition. This is where you bowl a pumpkin and the closest to the marker wins. No practice bowls, the four pumpkins were all slightly different sizes and you were encouraged to hurry up. Eric was the second bowler up and was immediately in first place. I followed shortly after and was in second place right up until the last bowler when I was pipped at the post. Eric won first prize. Lana took some photos and figured it was about time my photo was shown in Bruggie Tales. We are now regulars at the show and the various stewards have learned how to spell our non standard last name as they have to write it down so often. We'll be back again next year.